It's now February 29th in most of the world, which can only mean one thing! It's Ant's birthday! 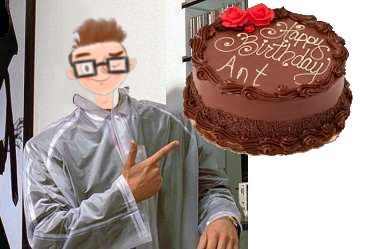 Normally birthdays are not worthy of a news post, but Ant only gets one every four years, so we've enabled Ant mode on the site for the rest of the day. Happy birthday Ant! See you in 4 years! I'd be okay with every day being Ant's birthday. You're so lucky to stay young for such a long time! Oh, he's a vampire? Cool! It took me 17 days to realise there was a new post in the front page. Belated happy birthday Ant! We all love you back! It took me almost a month. Since Ant loved us all throughout the years, I suppose its time to pay it back with more love! Fortunately, there won't be any new news posts between now and next Ant's-birthday, so we'll have a convenient view of how things have changed since now. Processed in an excruciatingly delicious 10 milliseconds.